A day is divided into two sets of 12 hours – from midnight until noon, and from noon until the next midnight. The hours in the first part of the day are a.m. (before noon), and the hours in the second part of the day are p.m. (after noon). a.m. and p.m. are short forms for “ante meridian” and “post meridian.” The word “meridian” comes from Latin and means “midday” or noon. First published in France in 2010 under the title Le temps qui passe and translated into It’s About Time: Untangling Everything You Need to Know About Time in 2014, this very useful information book is now back in print in a paperback edition. Narrators Jacob and Lily explore the concepts and measurements of time in an interactive, child-friendly manner. A second is explained as “how long it takes you to turn this page.” As increments increase, a minute is described as “a lot longer than a second! It’s how long it takes to count to 60.” On the following page, a colourful checkerboard with numbers listed from 1 to 60 offers an eye-catching opportunity to participate in a minute activity that you can time for yourself. In the longer span of an hour, accomplishments can include drawing a “really big picture”, playing a game or baking a cake. The conversational prompt at the bottom of the page suggests, “Let’s bake one together so we can see how long an hour is!”, and a recipe for pound cake is listed on the following spread. The section on clocks presents clear, easy-to-understand instructions on how to tell time on an analog clock: “To tell time correctly, first you read the number for the hour – the number that the short hand points to. Then you read the number for the minutes – the number that the long hand points to.” Labelled diagrams visually reinforce this information, and an arrow shows the clockwise direction the hands always turn in. Young time keepers can also make a “Paper plate craft” to help practice the concepts described, along with a “What time is it?” quiz and answer key. 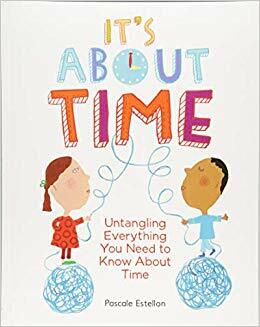 Resources showing children how to tell time are frequently requested in public libraries, and this book gets top marks for its presentation and delivery. What time is it? Time to make sure copies of this informative nonfiction book are on your school and library shelves.